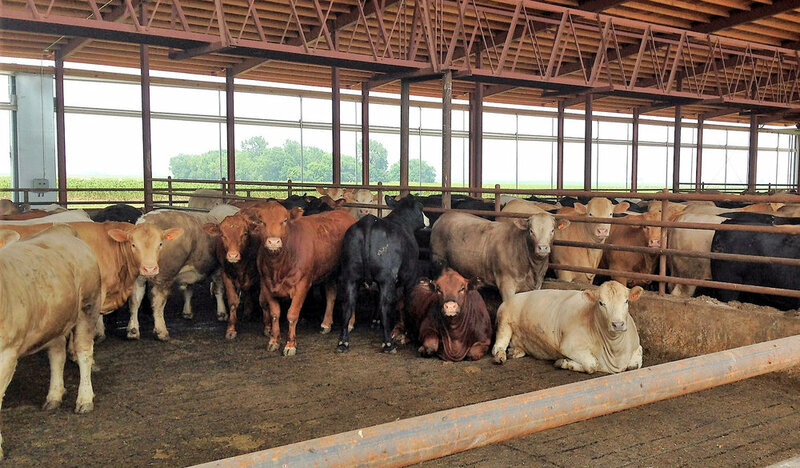 AgriSteel cattle barns are built to protect beef herds from harsh weather conditions so they stay healthier and gain optimal weight. Our monoslope cattle barn design keeps the harsh summer sun from overheating the herd. In the winter, it protects cattle from northerly winds. When our engineers design cattle barns, we consider the producer’s objectives, the types of animals that are a part of the operation and the size of the herd. In that way, our goal is to maximize production and help producers efficiently manage their beef, steer or youngstock operations. The monoslope building is the best suited building for a beef steer operation. The distinctive design features a single-pitch roof that is high on one side—generally the side that faces the sun. The design protects the herd from extreme weather conditions, thereby reducing the risk of respiratory stress and diseases. When aligned correctly on the farm site, the truss-free design naturally and efficiently maximizes airflow. This design helps to sustain an even air exchange, keeping the herd healthier while gaining optimal weight. A monoslope building design maximizes a herd’s comfort during the change of seasons, especially during summer and winter. When the sun is at its peak and the days are long, a large overhanging roof keeps the herd from overheating. Meanwhile, the herd benefits from southerly winds that enter the tall side of the cattle barn. The significant amount of fresh air, which contracts as it flows through the building, keeps the animals cool and dry. Even though the sun sinks lower during the winter, it is still able to infiltrate the barn, keeping the cattle warm. Northern winds are restricted as they blow against the low side of the structure, protecting the cattle and reducing their stress. To learn more about how our cattle barn design, engineering and fabrication can boost herd health or to become a dealer, complete the contact form or call 920-606-9549. You can also visit our construction management page to learn how we work with you side-by-side throughout the design and construction process.